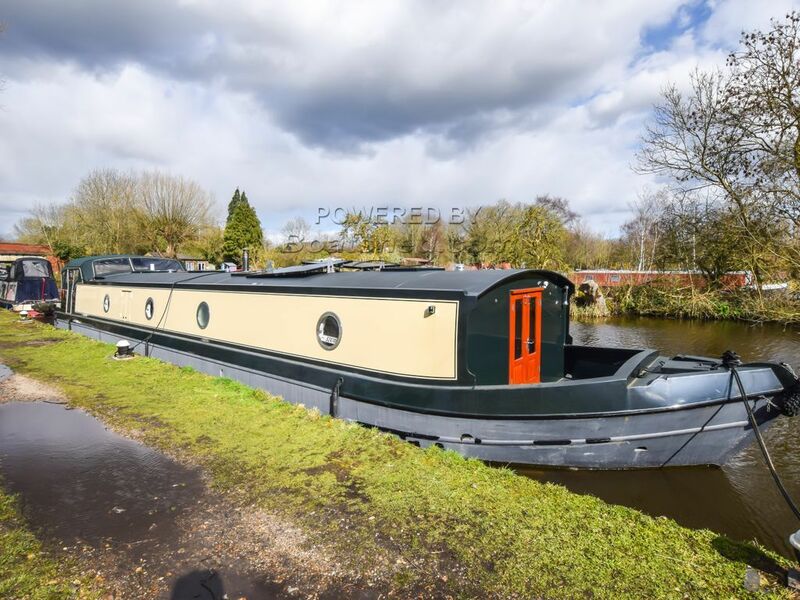 Boatshed London are delighted to offer this 60ft Collingwood wide beam for sale which has been fitted out to the highest standard and really is one of the best examples on the market. Only recently finished so essentially a brand new boat, no expense has been spared on equipment and materials that have been used here. The owners are a stylist and electrician duo and it is easy to see their expertise has been put to good use. Extra skylights that were requested at the build stage means all the rooms are bright and modern with the overall feeling of space that a 12ft wide boat gives you. The bathroom is the best I've seen on a wide beam. Copper pipes and a beautiful bath and basin really set it apart and there are clever design touches throughout the boat. The electrical and charging systems are top of the range. The solar charging and battery monitoring are all controlled from a central Victron panel which shows you how much is being generated by the solar/engine and how much you are using, all in real time. It's a great system and perfect for continuous cruising. The boat was epoxied at new and only has 36 hours on the engine. There is a full cockpit cover and maneuvering is made easy by wheel steering and a bowthruster. This really is a unique boat and only viewing it in person does it justice. This Wide Beam 60ft X 12ft has been personally photographed and viewed by Angus Rose of Boatshed London. Click here for contact details.